See my screed on Sarbanes Oxley for Pt 1. So I started this a couple of weeks ago, and boy do I apparently know liberals because guess what they are starting to bleat about again. 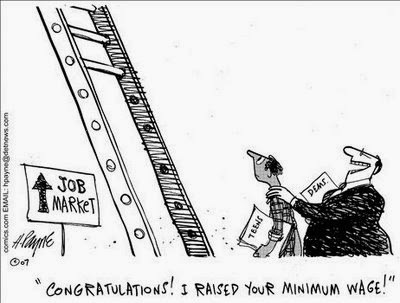 That's right, the minimum wage. I love it when my timing is awesome. Last week the Barack Obama official twitter account let us know scientifically via a chart to make it look all scientific and stuff how the minimum wage increase is teh awesome because look! Charts! What determines a wage, any wage? The value of the job being performed to the employer and the availability of workers for the job. The less workers there are, the more jobs will pay, because the resource is scarce. To create a scarcity of workers, you can do two things, exterminate people or create more jobs than there are people. I'm pretty sure option 1 is out so let's look at option 2. Creating jobs is not a goal of any company in and of itself and it NEVER has been. There is a need or a want for a product or service. Let's take an Iphone. The demand for this product was high. So Apple needed to produce them faster and that meant work for programmers. But the device was able to run applications if you could write for it. So companies began producing applications like Angry Birds or Pandora. This created a need for more programmers to create these applications. The demand for programmers continued as Apple wasn't the only one needing them. So we have many, many companies competing for good programmers. Company A offers what is the going rate but company B counters with a higher wage because of the scarcity of programmers. As this continues, the wages for programmers continues to rise. This makes programming a lucrative and enticing field for people coming into the workforce or perhaps those looking to make a change in their career. As more and more programmers come in, a threshold is met and wages may level off or even go down if there are too many programmers. But then perhaps a change happens, Android starts taking off for instance. Now programmer demand begins anew. So what set these wages? I'm over simplifying a bit but the marketplace set the wages. Or rather, there is no set wage, it is an individual transaction between a programmer and the employer. Some may elect to take less money for the perks of extra vacation days or a free mobile phone. Others may want more due to a higher skill set or experience. While you can do surveys every year and obtain a median wage that programmers make across the country, this wage isn't set because someone on high decided it. It's because that's how these millions of transactions have leveled out. "Well that's great if you have programming skills, but minimum wage people don't have the luxury to be picky." Not true, they do. If you looked at when the minimum wage $5.15 back through the 90's and early aughts, check what the average starting wage was. I remember clearly most McDonald's starting people at 7.00 an hour. How could that be? Simple, there was a scarcity of minimum wage workers BECAUSE the minimum wage was so low. This drove up the starting wages of lower end workers because there weren't enough to go around. But why was the labor pool so low? Cause labor was cheap. Let me let you in on something: All minimum wage jobs are not at McDonald's or even fast food. There are tons of mom and pop business out there that need cheap help. They could afford the minimum wage and some teenagers didn't mind taking a little less in exchange for working a job that granted them better job skills than a fast food restaurant did. Many small white collar offices could afford to let college kids do internships at the lower wages, giving the low end worker a chance to get experience they couldn't get at McDonalds. As soon as Washington arbitrarily raised the minimum wage, the McDonald's and big retail corporations were the ones that won. You hear me lefties? I know you hate big corporations (WalMart) and love small shops. Your feel good legislation has just made it too hard for the mom and pop organizations to pay these kids. They can't just raise their prices, they still do have to compete with WalMart. WalMart however can raise prices by mere pennies because of the bulk sales they make. Walmart doesn't necessarily want have to pay more for their workforce but until the wage was raised, they were already paying above minimum because of the scarcity of workers. So the sting wasn't felt by them right away. Same with McDonald's. So now small businesses either can't afford to keep workers or have to raise prices. Many didn't make it and went out of business, which now reduces competition and reduces the job pool. More people are out of work and can't find jobs because there is now a surplus of workers. Getting paid nothing, I might add. But minimum wage is higher so Yea! We feel good about ourselves! If we want more people to work and get paid more for the work, if we want kids to be able to have more choices to get job skills, we need to LOWER the minimum wage, not raise it. I know that sounds counter-intuitive but that is simply how economics work. Oh and those people who are not working anymore? They are getting unemployment or welfare. Which comes from taxes. Taxes that are getting raised to pay for it all which means even less money in your pocket and your company's pocket. If you don't have more money to spend on goods and services, how will company's make profit to expand? If companies can't expand, how will there be more jobs? It's a vicious circle, and the left would know all about being vicious. "Look, Yoda, if that is your real name..."
"Well whatever, doesn't it help people to have more money in their pocket when you raise the wage?" Ineffective. And as I stated before about stage 2 thinking, it's the unintended consequences that really keep people in poverty. Extra taxes, less available jobs, and no prospects. It's a good read, I highly recommend it. Why do they do it? Well it's an easy way to get the poor vote because all they see is they get an instant raise. Never mind what that does to their buying power. Second, many union contracts are tied to the minimum wage. You don't just give poverty workers an instant raise, you give union workers an instant raise too, many of whom are making in excess of $40 and hour. Those unions know how to produce votes too. "But how is someone supposed to support a family on minimum wage?" Four percent. Guess what: raising the minimum wage actually hurts that 4 percent. Because those low skilled workers are the first to be laid off so the company can stay in business. Well done lefties. So it could be said that raising the minimum wage to help the present is robbing people of their future. So much for "forward," eh Obama?